This project concluded on 31 December 2013. The Australian Feral Camel Management Project (AFCMP) addressed the urgent need to significantly reduce feral camel densities to lessen their impacts in remote Australia on biodiversity, wetlands, waterholes and sites of cultural value to Aboriginal people, infrastructure and personal safety. This project was one of the largest and most diverse nationwide collaborations ever to target an established pest species in Australia. It brought together twenty partners, including State and Territory governments (SA, WA, Qld, NT), Aboriginal organisations across the four jurisdictions, Natural Resource Management boards, conservation groups, the pastoral industry and commercial interests to protect identified refuges for biodiversity that were under threat from feral camels. 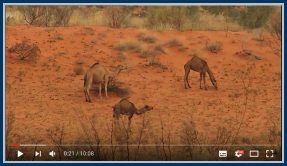 The project was guided by the extensive information collated in the reports of the Desert Knowledge CRC research project into feral camel impacts and management. The project was set up to reduce the feral camel densities at priority biodiversity areas. Since a four-year agreement between Ninti One and the Australian Government’s Caring for Our Country program was signed in February 2010, the AFCMP made substantial progress based on an early realisation of the need for comprehensive collaboration processes due to the diverse range of land tenures (Aboriginal, conservation estate, pastoral and Crown) across which feral camels roam and the diverse stakeholder interests, including commercial use. ‘Wraparound services’ is the term given to additional support services provided to an individual jobseeker or job-holder, often outside of formal vocational training. These services focus on the needs of the individual and promote collaboration between other service providers. This project explored better ways of working with employers, employment agencies and registered training organisations to develop a systemic model of wraparound service for jobseekers and job-holders in the Northern Territory. The findings emphasised the importance of formalising collaboration between existing service providers. The demonstration project was based on four case studies and an action learning methodology that makes the project findings readily accessible to end users. The Wraparound Services Demonstration Model outputs are freely available through the website www.wraparoundnt.com.au. Included are a series of practical tools for improving provision of Wraparound Services. Batchelor Institute of Indigenous Tertiary Education and Ninti One worked together on the Wraparound Services Demonstration Model project, with funding from the NT Department of Business. The Australian Government Department of Families, Housing, Community Services and Indigenous Affairs commissioned us to investigate the issues associated with alcohol misuse and abuse in Aboriginal and Torres Strait Island communities in the Ceduna region. The project also aimed to seek out and engage with those who are not using existing support services and to determine why. This is so that service providers can better design and implement programs to suit all clients in need. This short project gathered feedback from community members and key stakeholders about the possible benefits and/or barriers of introducing income management in the Ceduna region. The federal Minister for Social Services announced that further consultation would occur with residents prior to any introduction of income management programs in the region, consistent with the recommendations in the Ninti One report. Ninti One was contracted by the Northern Territory Department of Health to undertake a survey of tobacco usage in Ntaria and with Wurla Nyinta (the Local Reference Group) to coordinate the design and delivery of an Action Plan for the reduction of tobacco use in that community. The project links the relevant Local Implementation Plan (LIP) priorities and the strategies and actions agreed between Wurla Nyinta on behalf of the community and the Federal Government National Partnership Agreement on Remote Service Delivery. A review of all available literature and all workplace policies for organisations operating in Ntaria found that Aboriginal communities can and do promote tobacco use reduction successfully, with each community choosing a different combination of strategies based on their needs. The literature and policy review provided the background for the formulation of a questionnaire for community organisations about tobacco usage. The results of the reviews and the questionnaire helped to shape the development of the Ntaria Tobacco Use Reduction Action Plan and a set of recommendations which has allowed Ntaria to act at a community level, in line with public policy and the community priorities in the LIP, to reduce tobacco use and to further support tobacco cessation activities. The project report also provides examples and lists of resources, including support programs, helpful strategies, general and health information, graphic signs and webpage links useful when planning and implementing a community tobacco use reduction action plan. Remote Aboriginal communities in the Northern Territory have experienced significant change in years. There are now more agencies (both government and NGO) delivering services and they work differently from the way that communities have operated in the past. Two-way governance is about creating and achieving the best possible outcomes in remote Aboriginal settlements through compliance with the mainstream governance laws, without detriment to Aboriginal rights and interests in culture, people, law, knowledge systems, language and country. develop and produce a learning resource which would promote a wider understanding in remote Aboriginal communities of government processes and which would help to build the capacity of remote Aboriginal leaders to understand and deal with government in a meaningful and sustainable way. All levels of government seek to clearly explain in clear language the obligations of Indigenous board and committee members, and where possible commit to streamlining community consultative structures to alleviate the work burden on board and committee members. All research reports and recommendations made on behalf of governments are provided to affected communities through appropriate feedback mechanisms to the community concerned. Protocols for communicating through boards, advisory groups, elected officials, etc. to be agreed and adhered to by all parties. In two-way processes, develop and adhere to stringent mechanisms around cultural competence in local service agreements. Governments to continue using interpreter services as a minimum benchmark for community engagement. Ongoing local cultural awareness training and support to be provided for resident and visiting staff. Protocols for external visitors are developed for each community. Organisational representatives and government employees and managers should be encouraged and supported to view their workplace from an Indigenous perspective. Establish mandatory requirements for contractors to adhere to cultural protocols through undertaking cultural awareness training. Active coaching for Aboriginal community members and non-Indigenous managers who are engaged in brokering governance arrangements. The Australian Collaborative Rangelands Information System (ACRIS) provides natural resource management and environmental information for decision makers – from regional bodies responsible for natural resource management, to government policy makers – to make better decisions about how we manage our rangelands. Rangelands in Australia encompass tropical woodlands and savannahs in the far north, and vast grassy plains including spinifex, mulga woodlands and saltbush and bluebush shrub lands in the south. Huge climate variability, short growing seasons and drought distinctly characterise rangeland environments. ACRIS provides a structure to monitor the condition of these diverse environments at a continental scale. The contract required Ninti One to coordinate the collaboration of partners that collect information and data on the value and production of agricultural (including pastoral) production in the rangelands, update (from Rangelands 2008 – Taking the pulse) socio-economic profiles of rangeland bioregions, examine data collected in the Agricultural Resource Management Survey (ARMS) and compile data on the value and production of mining. The WaterSmart Pastoral Production™ project was managed through Ninti One and funded by a National Landcare Program Grant from the Department of Agriculture, Fisheries and Forestry. The project involved partners from the pastoral industry, agricultural equipment suppliers and various Natural Resource Management boards. The WaterSmart Pastoral Production™ project identified cost savings of up to 50% per annum for the supply and maintenance of stock water. The aim of the WaterSmart Pastoral Production™ project was to demonstrate and evaluate the use of new and novel commercially available water management technologies. These included technologies relating to water storage, remote telemetry, pumping, pipes and delivery systems. Five commercial pastoral enterprises were involved in the project representing a range of production systems across South Australia, Northern Territory and Queensland. The close linkages of equipment suppliers (primarily based on the east coast) and the end users resulted in improvements being made to technologies making them more suitable and robust for the desert environment.